Purple moorhen a migratory bird in Nalsarovar. They migrate from northern breeding areas to Nalsarovar lake as its southern wintering grounds. Purple moorhen bird is one of the rare birds who travels thousand kilometer from their native place to Nalsarovar once in a year. 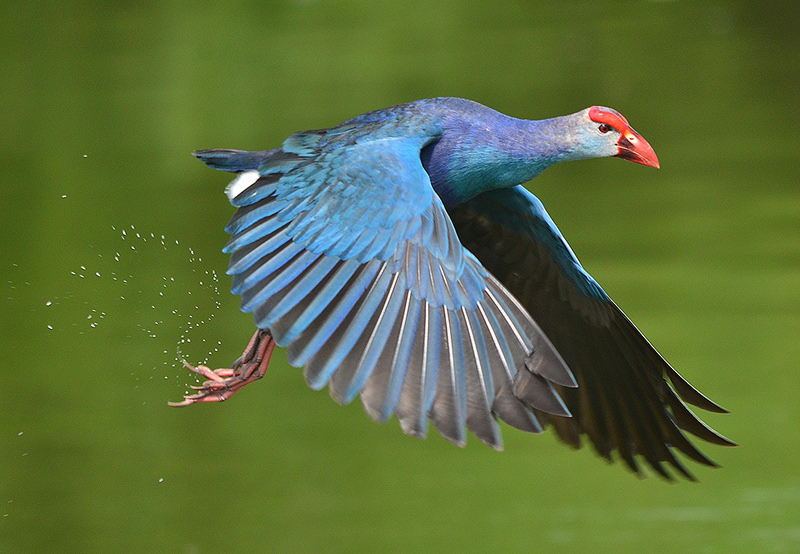 There are almost 200 different species along with Purple moorhens who fly hundreds and thousands of kilometers to Nalsarovar lake in Gujarat, India for feeding, breeding and raising their young. Nalsarovar is a bird watcher’s paradise. Tourists coming to Nalsarovar enjoy watching Purple moorhen bird during the Indian winters. More than 200 types of birds mainly waterfowl inhabit this lake and come from as far as Siberia. Nalsarovar in Gujarat is a bird watcher’s paradise, one can find rosy pelicans, lesser and greater flamingos, crakes, brahminy ducks, purple moorhen, herons, white storks, various species of bitterns, grebes etc in the lake. Best time to visit Nalsarovar is in winter between November to February. However, migratory birds starts arriving in October and stay until April but their population reaches its peak in mid winter. Best time to see the birds is early in the morning and in the evening. One can visit Nalsarovar in Sanand by personal vehicle or taxi. Gujarat Tourism also offers luxury tent accommodations 1.5km from the lake. Other than few more resorts there is no proper accommodation available. Nalsarovar is a Bird Sanctuary since April 1969 and Nalsarovar is a Ramsar site since 24 September 2012. Spread in the area of 120.82-sq-km Lake, a serene marshland with shallow water. It is located near Sanand Village, in Gujarat. Mainly inhabited by migratory birds as their wintering ground, Nalsarovar wetland is the largest wetland bird sanctuary in Gujarat, and one of the largest in India. Purple moorhen a migratory bird in Nalsarovar is a delight to see.